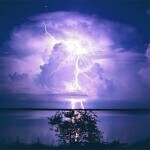 It’s that time of year…thunder rattling the windows at night, lightening illuminating the bedroom walls, torrential rain beating upon the roof, Fourth of July fireworks…and a dog, panting and trembling next to the bed as the storm rages outside. 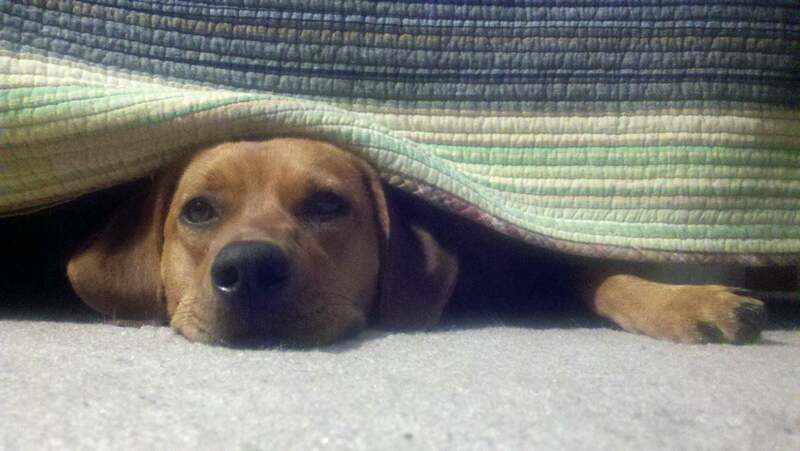 Thunderstorm and fireworks phobias are very common, particularly as dogs age. 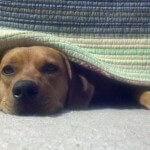 This type of anxiety can manifest with a spectrum of symptoms, from just mild attention-seeking behavior (Fido may come over and sit on your feet, but otherwise acts pretty normally) to severe, panic attack-like behavior. When I was a veterinary student at the University of Pennsylvania, a German shepherd was admitted to the surgery service after he crashed through a plate glass window during a thunderstorm. He was covered in lacerations that required surgery. 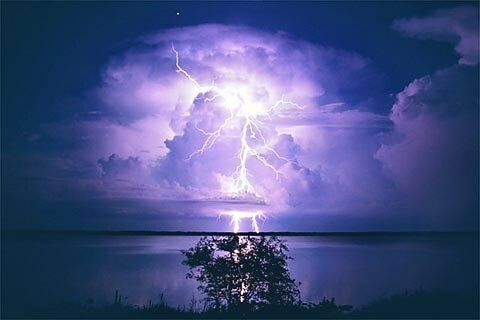 What to do if your own Fido is thunderstorm-phobicor fireworks-phobic?Allow Fido to seek out the location in the home that seemsto soothe him the most, whether it be a basement, a bathtub or plopped down on your feet. If he wants to be with you, let him, but try not to hold and calm him too much, as this may reinforce his anxiety and make it worse the next time. Put a a hand on him, so Fido feels your presence, but try to avoid allowing him to sit on your lap. I know it is hard to avoid, but by attempting to soothe our pets too much, we actually increase and reinforce their fears. For mild to moderate cases of thunderstorm phobia, our practice has seen great success with a product called the Thundershirt. This product looks like a basic t-shirt for your dog, but it provides gentle pressure that quiets the nervous system and in turn exerts a generalized calming effect on Fido. It is a similar concept to swaddling a newborn baby to console her. One of my clients reported that, after putting the Thundershirt on Fido for the first time, he virtually fell over and went right to sleep. Certainly not all dogs will exhibit this dramatic response, but even a small bit of calming can be beneficial. The Thundershirt can also be used for dogs with other types of anxiety: car, fireworks, confinement, or separation anxieties. 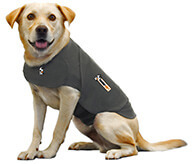 The Thundershirt should not be left on a dog continuously, as the dog will likely desensitize to it and thus render it ineffective. Used periodically for anxiety, this seems to be a safe and effective product. 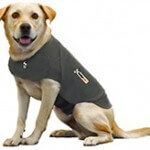 Dogs that have severe thunderstorm phobia likely need more than a Thundershirt alone. For dogs that are inconsolable, panting and trembling severely, or in danger of injuring themselves or others during a storm (think of our German shepherd and the plate glass window), I will prescribe anxiolytic medication such as Xanax. Xanax is in a drug class called the benzodiazepines; these drugs increase the number of beneficial neurotransmitters in the brain, thereby reducing anxiety. Drugs like Xanax are typically not recommended for long-term use but for periodic episodes of anxiety (like during fireworks!) Xanax can make your dog lethargic, which in this case may be a beneficial side effect. In a rare subset of dogs, Xanax can disinhibit aggression (lowering Fido’s threshold for aggressive behaviors so he becomes less calm and more angry.) I usually recommend that my clients do a “trial run” with this medication before a storm is in progress, to see how Fido responds. This is the time of year when our prescription request line is chock-full of requests for prescriptions to help Fido muddle through Independence Day fireworks and summer storms. We are happy to help- just give us at least 24 hours notice and we can find the right medication to help Fido through this stressful season.